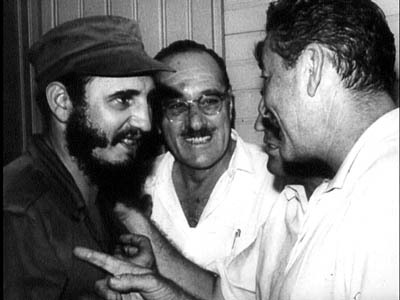 Errol Flynn and a producer named Victor Pahlen were spending time in their favorite Cuban casinos in 1958 when Castro's rebellion was nearing success. 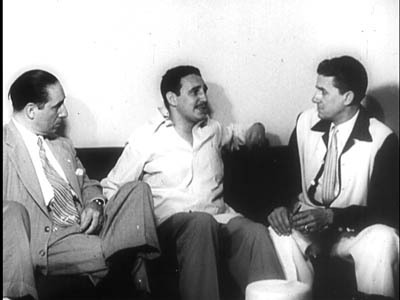 Although both men had enjoyed the good life in Batista's Cuba, they realized that they were sitting on a unique opportunity, so they stayed in Cuba, hung out with the revolutionary troops, and took to the streets with silent cameras to record history as it happened. The result of that footage was this unique fifty-minute documentary called Cuban Story. It was written, edited, and directed by Pahlen. Errol Flynn did some "narration" for the film, which basically means that he offered some thoughts on camera for about five minutes. Flynn may have been inebriated at the time, and his health was poor enough to cause him to wheeze noticeably when he did his brief monologues. He would be dead within a year. Except for the five minutes when Flynn talks directly to the camera, the visuals consist entirely of 45 minutes of silent newsreel footage of inconsistent quality. That newsreel portion of the film is also supposed to be narrated by Errol Flynn, but it is not. Oh, it was all delivered in the first person as if it were Flynn speaking his thoughts, but the lines were actually spoken by someone else pretending to be Flynn, albeit with a completely different voice and accent! 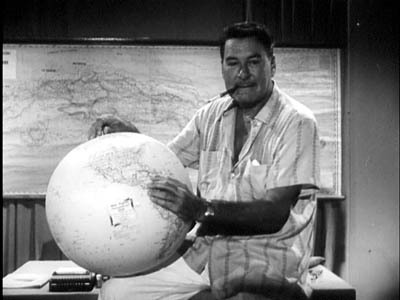 The soundtrack for the newsreel footage consists entirely of the faux-Flynn narration and several stirring reprises of "Adelante, Cubanos" ("Onward, Cubans"), Castro's revolutionary anthem. 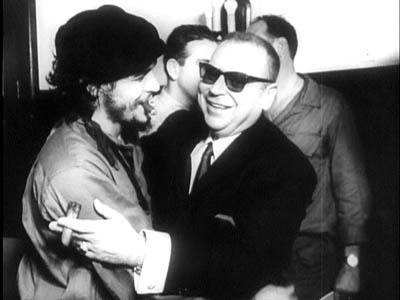 Unfortunately for Victor Pahlen and his film, Castro's relationship with the West soured after his victory, and Fidel soon began to cement his alliance with the Soviet Union. By the time Cuban Story was ready to screen, its pro-Castro tone had made it anathematic anywhere but Russia, so the film was screened exactly once, at The Moscow Film Festival. After that it was forgotten, completely unseen for more than 40 years until recently unearthed and released on DVD with an introduction by Victor Pahlen's daughter, Kyra. By any objective standard, it is a weak documentary. The narration is shallow and soporific, the Flynn impersonation is a sleazy and ineffective trick, and the incessantly repeated theme song will stir memories of riding through "It's A Small World." Some of the footage is actually in good shape, but other parts are deplorable. The DVD box says it all: "The picture and sound quality of this DVD will at times be below contemporary standards." If that's how their marketing guys spun it on the box, you can guess how an objective reviewer might have phrased it. None of that really matters, however, because the film consists of priceless and historically significant footage which had been lost for four decades and still can't be seen elsewhere. If you are interested in the Cuban revolution, this film is actually worth seeing. Flynn shows where Cuba is! He provokes some unintended laughter by tossing the globe away after he is finished with it, causing it to bounce noisily off camera. 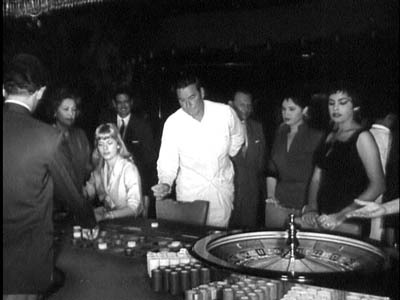 Flynn playing in George Raft's casino in the Batista days. The blonde to his right is his very young (14 or 15) girlfriend Beverly Aadland. 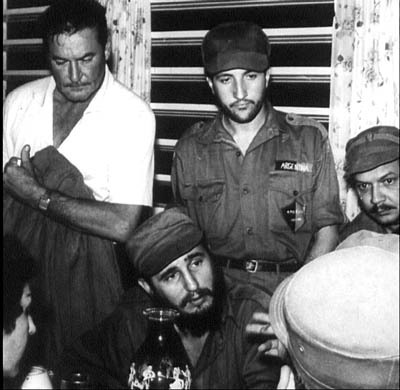 Above and right: Errol Flynn and Fidel Castro, together at last. Rare footage of a beardless Castro. The usually brooding Che Guevara caught in a rare moment of merriment. The DVD consists solely of the film and a very brief introduction by Victor Pahlen's daughter, Kyra. Based on this description, Cuban Story is a C+. You might just as easily call it a D, because it is actually a terrible documentary, but in my opinion that simply doesn't matter because the footage is a priceless and historically significant record which had been lost for four decades and still can't be seen elsewhere.